Southern Cremations & Funerals at Cheatham Hill is family owned and operated, offering full-service funeral, cremation and cemetery services to families in Cobb County and the Atlanta Metro area. We can offer you everything you need, at one location: a funeral home, on-site crematory, two chapels, cemetery, mausoleums, cremation garden, and columbarium. 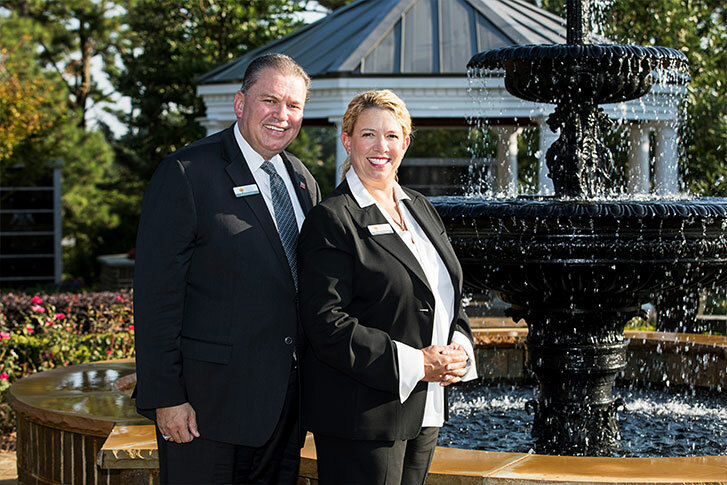 Owners and siblings Christine Hunsaker and Robert Hunsaker together have more than 50 years of experience in the funeral and death care industry. They are also industry leaders in helping educate and provide families with the services and products they desire to memorialize their loved ones. After purchasing the business in 2014, they put together a skilled and compassionate team of funeral professionals and administrators who love what they do and put our families first. We are a 100% full-disclosure funeral home, crematory and cemetery – and believe in treating each family with kindness, professionalism and honesty. We listen and we educate, helping families plan a fitting memorial to their loved one that will create meaningful experiences and lasting memories. We believe that funerals and memorial services should be affordable and that families should have many options from which to choose. Click to see everything included in our five Cremation Packages and five Funeral Packages. We are happy to serve individuals of all religions, ethnicities and backgrounds, and are knowledgeable and respectful of various customs that honor their loved one. We provide all services onsite at our facilities in Marietta and only our caring employees will bring your loved one into our care. Click on the video below to view our facilities and grounds, and find out more about our company.